My little congregation had its annual Hannukah party on Saturday night. It was fun. We vainly attempted to sing the songs of our childhood…most of which came out like “Hanukah l’Hanukah na na na nan na” or “spin the whirling dreidel na na na na”. We lit candles on the menorahs we brought, narrowly avoiding a conflagration. 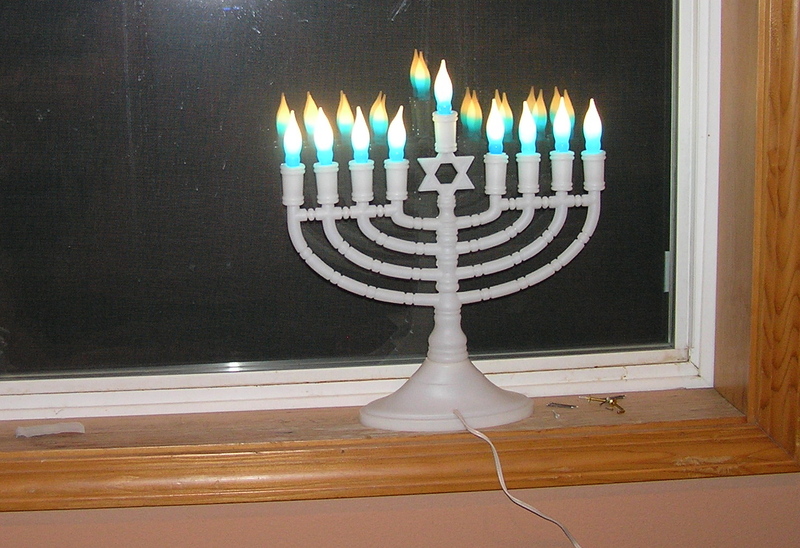 I won a gaudy plastic electric menorah. 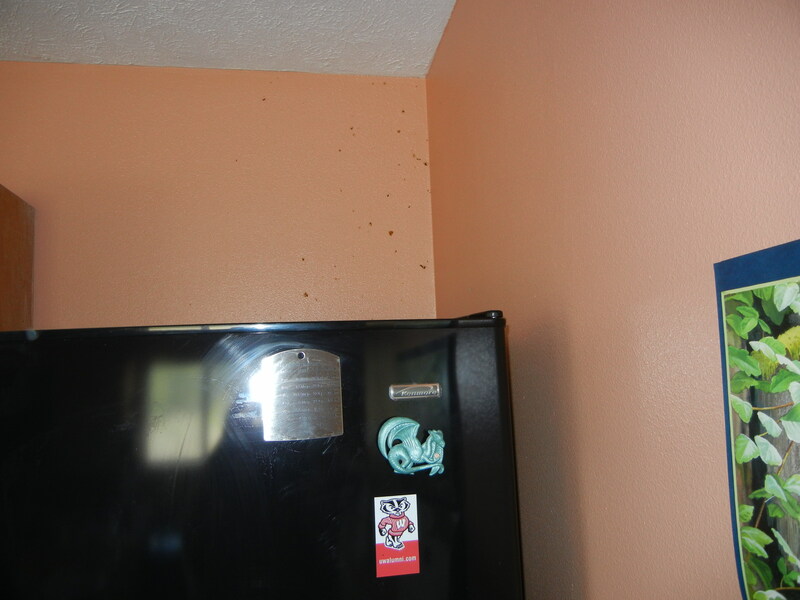 The only problem was that the latkes were burnt. I don’t mean overdone, but most of them incinerated to hard flat cinders. 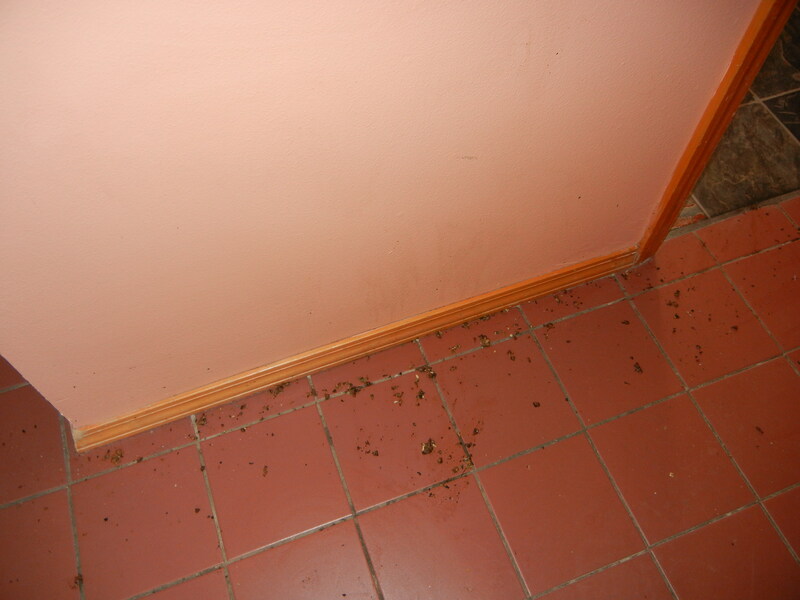 It seems that the men of the congregation were making the latkes – a reasonably simple task. As you make more latkes, you typically put the cooked ones into the oven to stay warm. 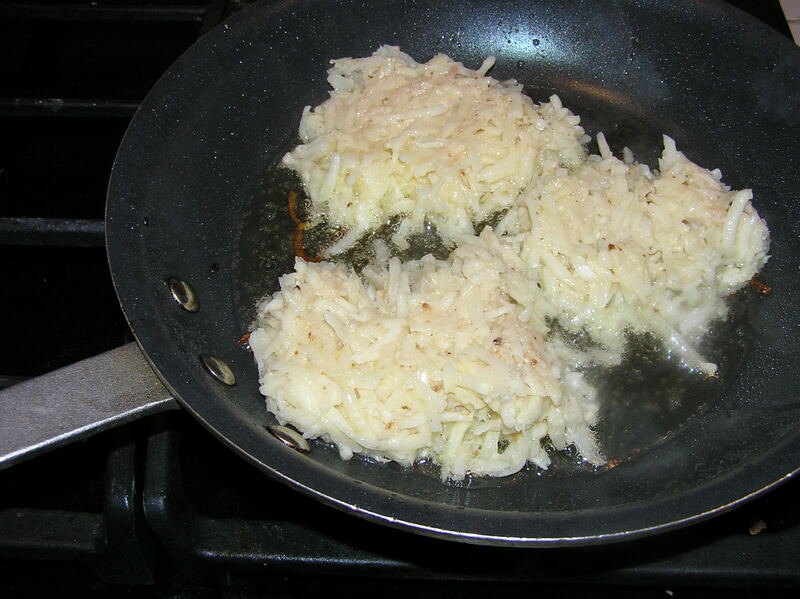 Somehow, the latke-makers were told to turn the oven up to 400 degrees – ergo latke cinders. When I was growing up, my grandma had a latke party for all the grandchildren every year. The menu was latkes and more latkes with sour cream and apple sauce on the side. There may have been cookies or something for dessert…I don’t remember because I was always totally, blissfully full of wonderful, oily latkes. Latkes are traditional for Hannukah because they are cooked in oil, which is symbolic of the miracle of one day’s oil for the eternal light in the temple lasting for 8 days (the number of days of the Hannukah holiday). And because they are cooked in oil, they are not exactly a low fat food. But my latkes are only about 3 grams of fat per latke. The trick is having the oil hot enough so that the latkes don’t absorb too much oil, draining the latkes well on paper towels, and most important, not eating too many. By the way, many recipes for latkes add various ingredients, such as chives or even other vegetables. Don’t do it!! My Grandma would be horrified. Those imposters are not latkes, they are some other sort of side dish. 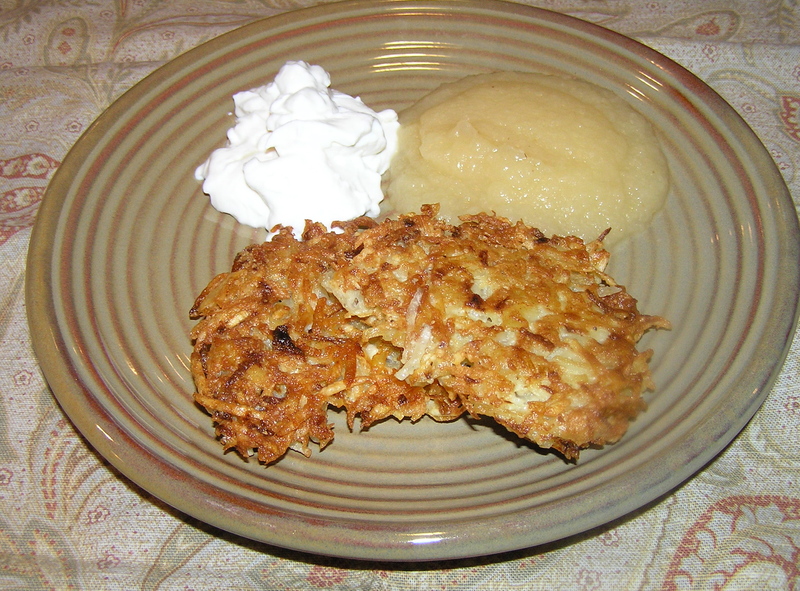 A good latke is potatoes and onions held together by egg and matzoh meal – nothing else. And some people use pre-grated potatoes. 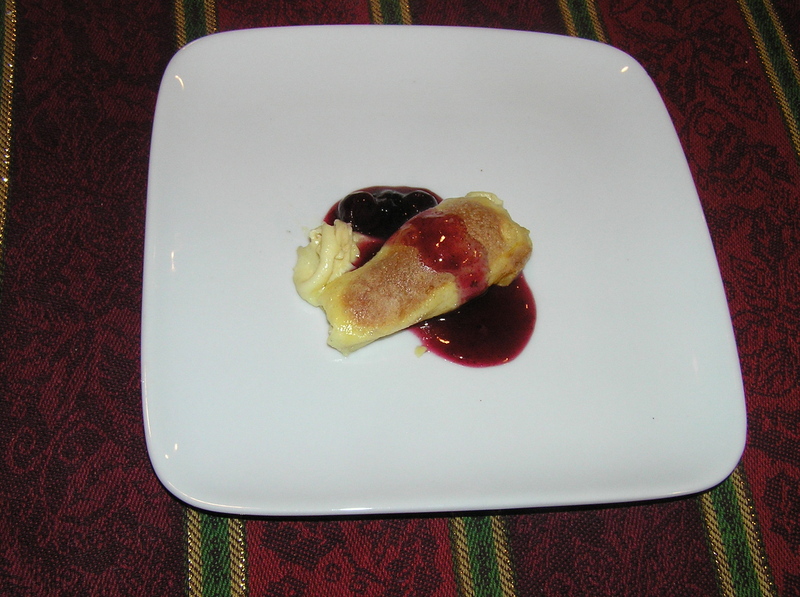 I guess Grandma might ok that, after all, she told me blintzes came from the freezer case. I still grate my own potatoes and onions, albeit with the food processor and not the knuckle-scraping box grater…but if you need to save time, I guess pre-grated are ok.
Preheat oven to 200 (you could also use a warming drawer if your stove has one). Line a baking sheet with several layers of paper towels. 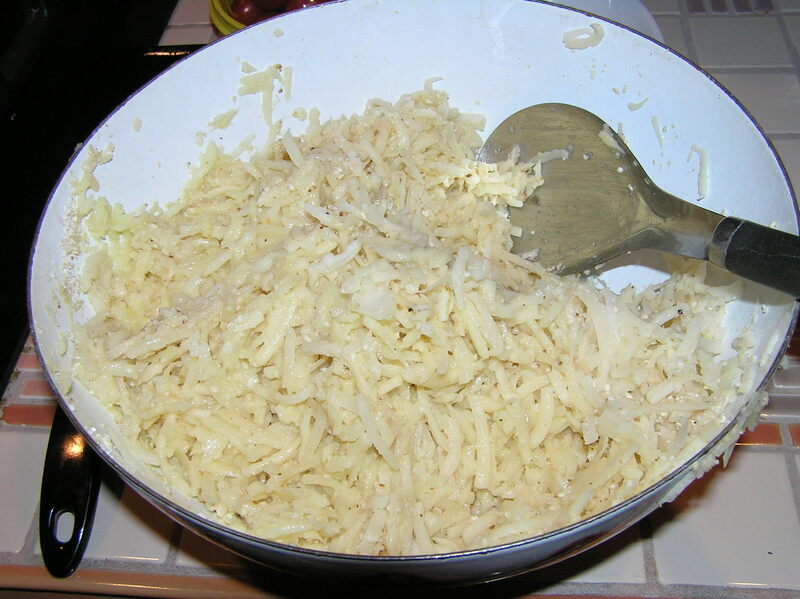 Using the large holes of a box grater or grating disk of a food processor, grate potatoes and onion together. Using your hands, gather up handfuls of the potato mixture and squeeze as much of the liquid from it as possible. (I usually do this right from the food processor and put the squeezed potatoes into a large bowl.) Add matzo meal, egg substitute, salt, and pepper. 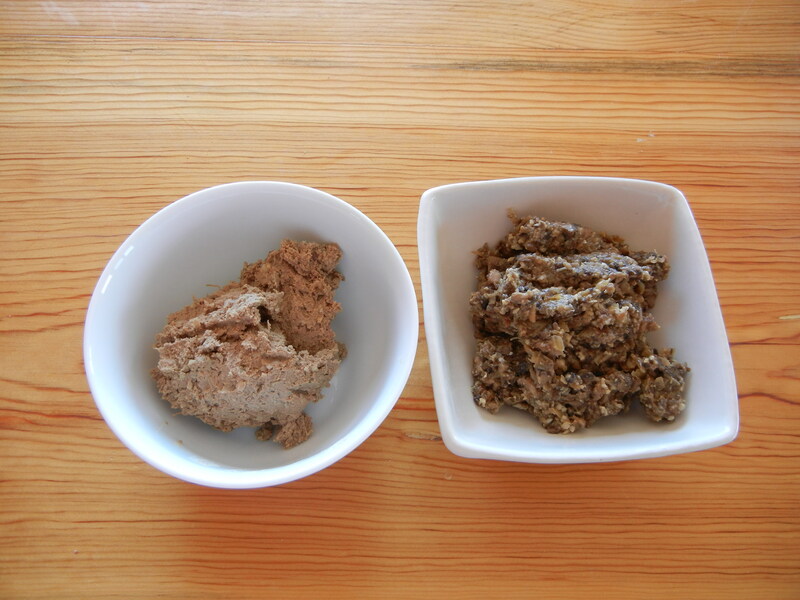 Mix thoroughly – I do this with my hands since I haven’t been able to find a spoon that can mix it well enough. 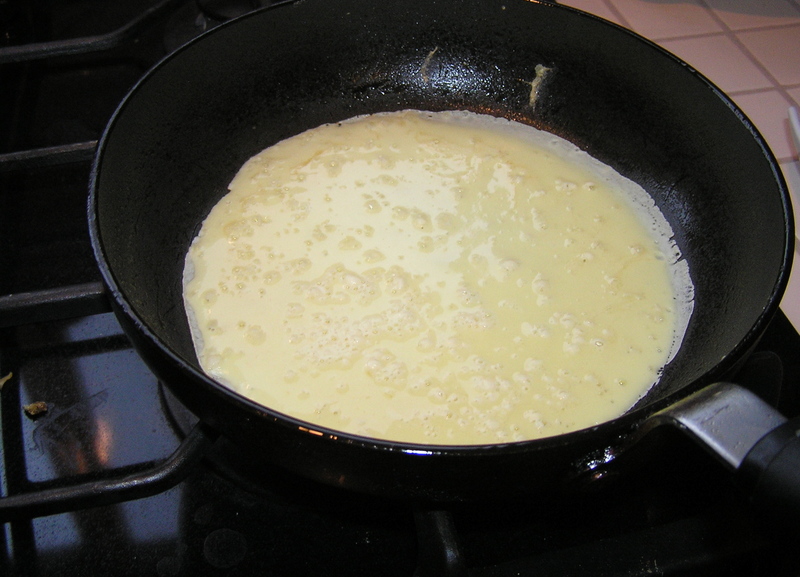 Place a deep skillet over medium-high heat and add oil until it comes ½ inch up the side. Heat until a little piece of the potato sizzles when you put it into the oil. Cook the latkes in batches by carefully adding about 1/3 cup potato mixture for each pancake to the oil, pressing down on the mixture to spread it into a 3-4 inch latke. Don’t crowd them, and don’t make them too thick or they will burn on the outside before they cook on the inside. 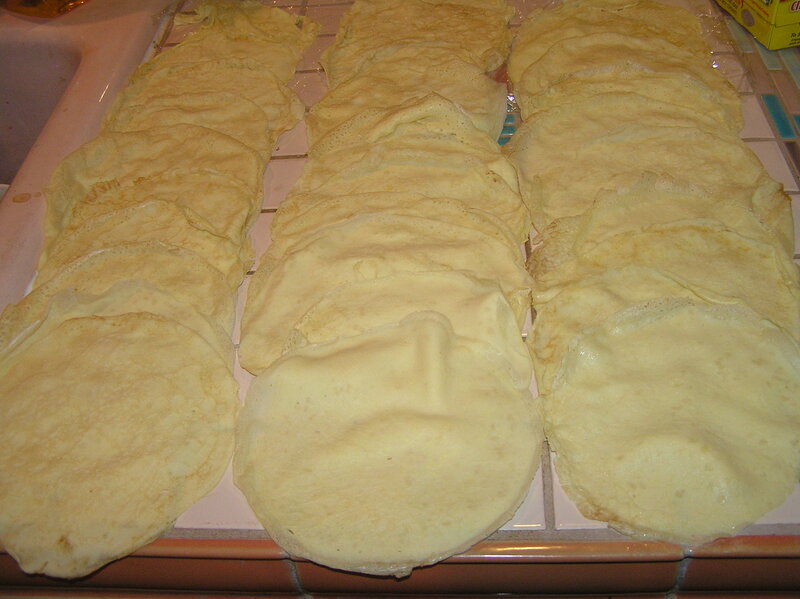 Fry, turning once, until they are deep golden brown on each side – about 6 minutes total. Keep an eye on them so they don’t burn. Using a slotted spatula, transfer the latkes to the lined baking sheet and keep warm in the oven while you make the remaining latkes. You may have to add a little more oil to the pan for later batches – let it heat up before you add more potato mixture. 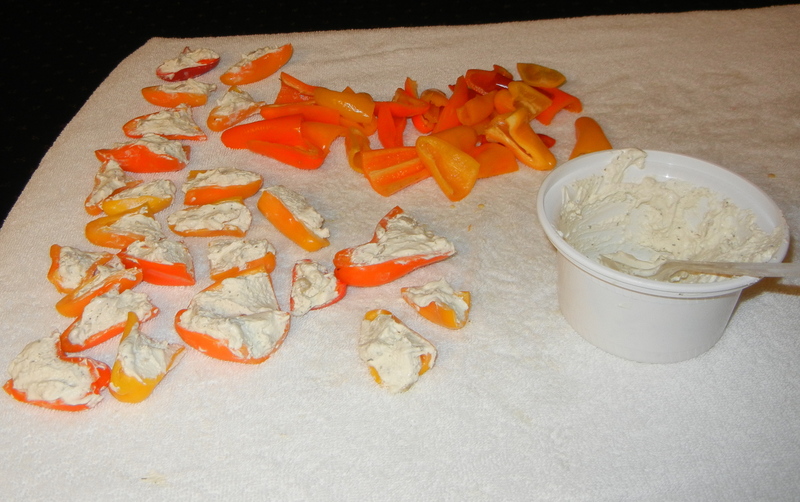 Serve with applesauce and non-fat sour cream. Makes about 15 latkes with about 3 grams of fat/latke. 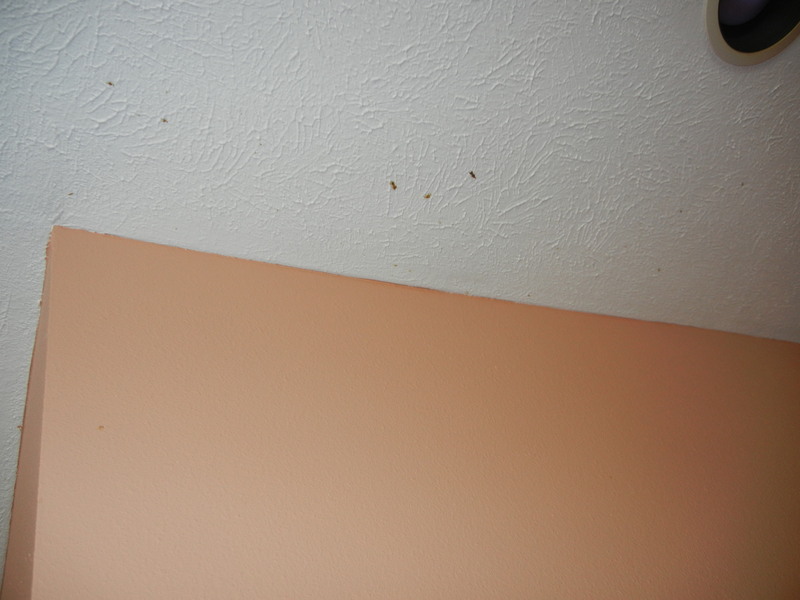 OK, I confess – this picture lies. I did not eat only 2 latkes. I am sitting here blissfully full of latkes, with oily hands, lips and cheeks, feeling like I am 8 years old again. 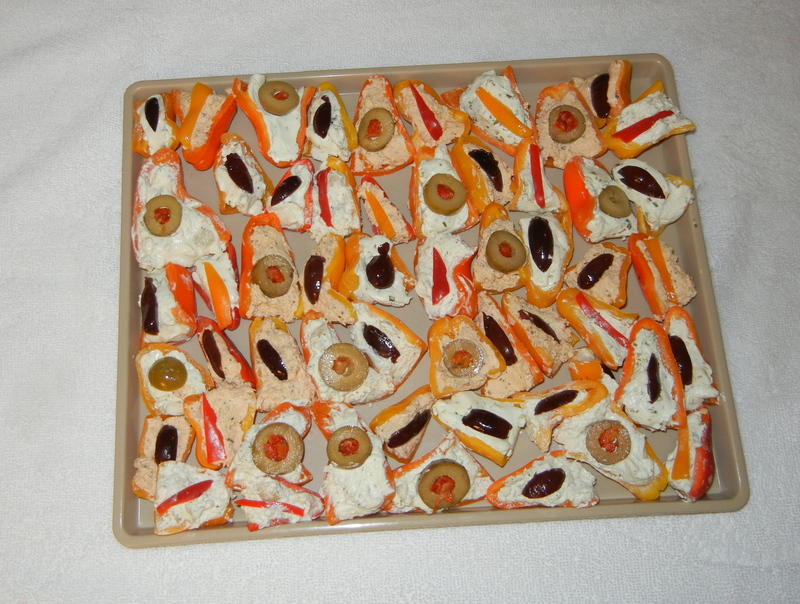 I am going to a potluck tonight where we have been asked to bring a dish that was traditional in our family. This is the cake that was at every occasion. It was at holiday dinners (okay, not Passover) and at casual family gatherings. 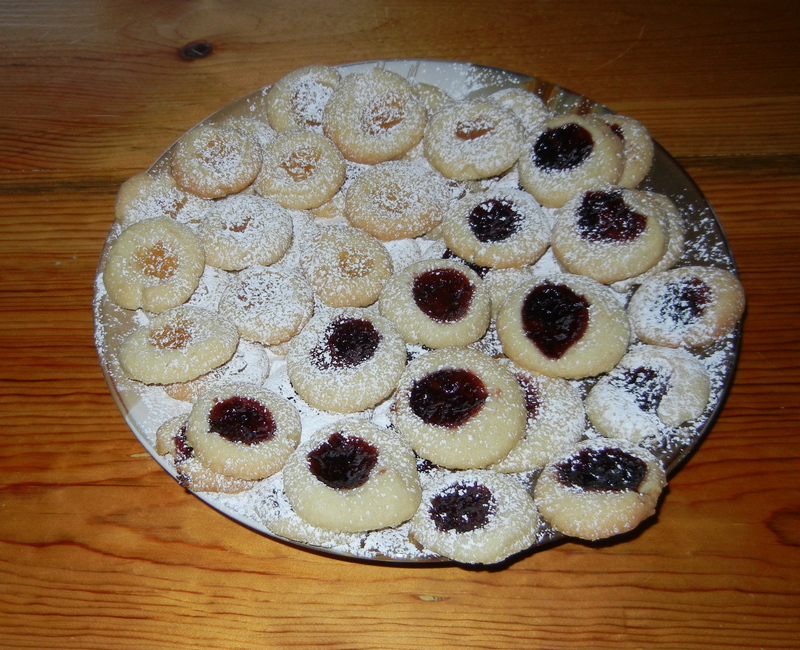 There was usually some left over to be eaten later for “coffee with a little something”. My Grandma Fredyl, being from the “old country”, never used a recipe when she cooked. She threw in a handful of this and a pinch of that until it felt right. Whatever she made always turned out fabulous, especially the baked goods. My memory of my grandmother’s little apartment is that it was full of long taffeta gowns (she was a seamstress) and always smelled cozily of baking butter and cinnamon. Family legend has it that Aunt Gladys, fearing that the formula for her mother’s wonderful cakes and cookies would vanish when Grandma passed on, shadowed Grandma around the kitchen as she baked. (My image of this is rather funny, Gladys being a large woman about 6 feet tall, and Grandma a diminutive white-haired lady, barely 4’10”.) Each time Grandma threw a handful or a pinch into the bowl, Gladys stuck out a measuring cup so she could codify the ingredients. This cake is one of the results of her efforts. Preheat oven to 325. Spray a tube pan (the standard size) with cooking spray and dust lightly with flour. Be sure to tap the pan so that excess flour comes out. Whisk together flour, baking soda, baking powder and salt. Set aside. In the bowl of a mixer, beat butter and sugar at medium speed until smooth and well blended. Add egg substitute and vanilla and beat until well blended. 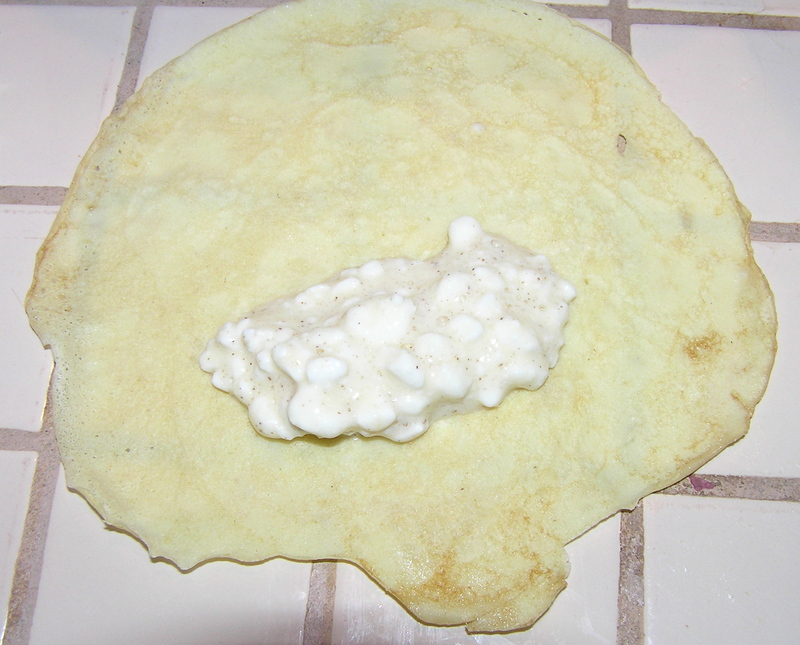 Add flour and sour cream alternately, starting and ending with flour. (I usually add the flour 3 times and the sour cream twice. I used to think that this alternate adding was the result of Aunt Gladys’s recipe recording technique, but I’ve actually seen it in other recipes.) Beat on low speed after each addition until combined. Don’t over beat. 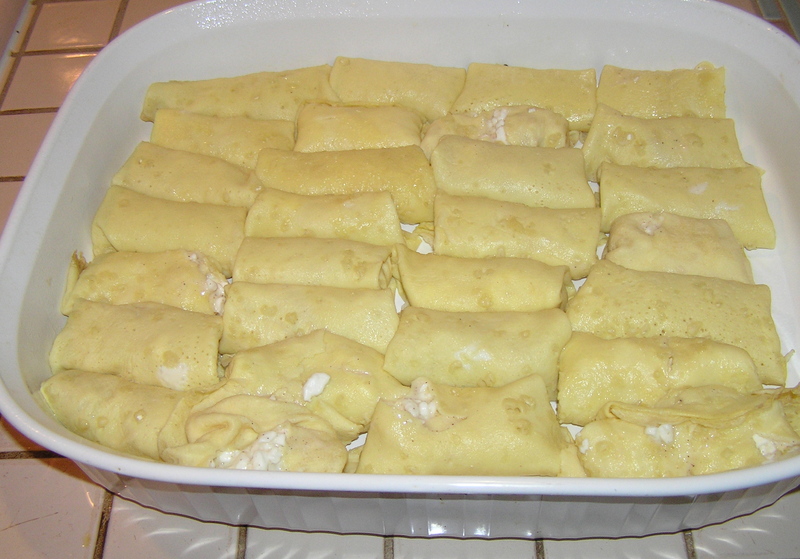 Put I/2 of batter in tube pan and spread more or less evenly. Sprinkle generously with cinnamon sugar mix and then sprinkle nuts evenly over cinnamon and sugar. Spoon remaining batter over cinnamon-sugar-nut layer, spreading gently so the batter more or less covers that layer. Bake at 325 for 40-45 minutes or until a wood pick inserted in the cake comes out clean. Remove from oven and cool in pan for 10 minutes. If you have the kind of tube pan with a removable center, loosen the cake around the sides with a knife, and cool for 20 more minutes otherwise cool in pan for 30 minutes. Remove from cake from pan and sprinkle top with cinnamon-sugar mix (my mother sprinkled the top with more chopped nuts, but that would have added another gram or so of fat, and besides, it’s my recall that most of them fell off when you cut the cake. Cool completely on a wire rack. This makes 20 servings at about 6 grams of fat/serving. Grandma cake on Grandma’s glass serving plate. Grandma cake on my plate. Ooops, it didn’t make it to the potluck. And it tasted just like my mom’s. Hint: If you don’t keep cinnamon-sugar mix handy, you should mix some up. It’s useful for sprinkling on so many things – oatmeal, toast, bananas, whatever. There’s no recipe – just add enough cinnamon to the sugar to make it as cinnamony as you like. I keep mine in a shaker right on the table.